[Perry] was interested in adding a 4th axis to his CNC machine, but not very excited at the prospect of spending hundreds of dollars on the parts and electronics to make it work. There is a very clever and very inexpensive way to add a 4th axis to a CNC machine, though, and after a bit of fabrication, he was able to add a ‘rolling’ 4th axis to his machine. The idea for this build comes from [Bob] over on the CNC Shark forums. Instead of adding a motor to rotate a work piece around, [Bob]’s build simply mounts it between two jaws, and rolls everything around against the bed of the CNC router. Don’t have a clue what that means? Check out the picture to the right, and you’ll see brilliance built in Delrin and HDPE. By mounting two rack gears to the bed and two geared jaws to the carriage of the machine, moving the router in the Y axis also rotates the 4th axis. This is far, far too clever; it doesn’t require any additional electronics and the only software tweaks are a bit of G-code hacking. [Perry] took one look at [Bob]’s project and decided this would be the perfect build to get him a 4th axis. The parts for this build were fabricated out of black HDPE, with the only real change to the design being a ‘variable length’ 4th axis. Instead of two rack gears mounted to the bed of the machine, [Perry]’s build only uses one rack, with the other end simply rolling on the bed. 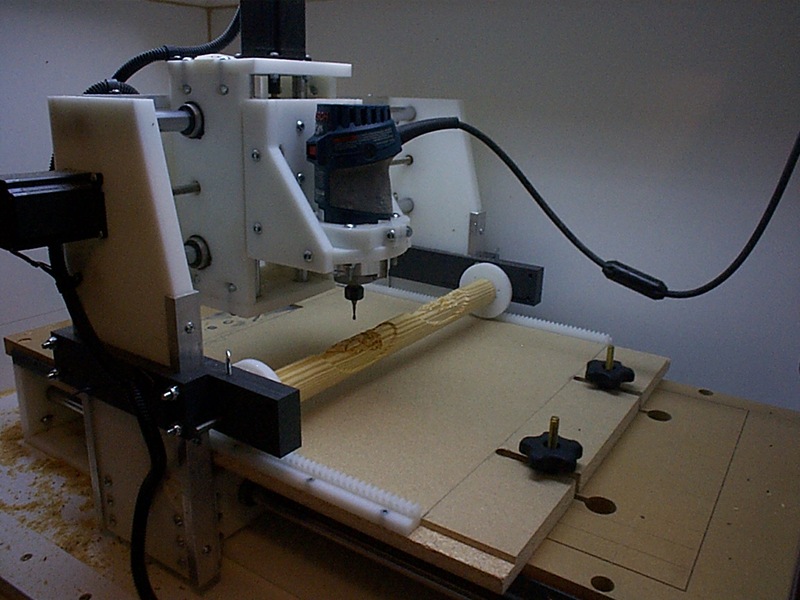 There are a lot of clever inventions that don’t work, so what’s the verdict with this CNC hack? It actually looks pretty good. [Perry] was able to turn some square stock into round stock, and able to engrave a spiral around a cylinder. You can check out those videos below. Mobility impairments can range from fine motor control issues to quadriplegia, and people who suffer from them are often cut off from technology by the inability to operate devices. [Cassio Batista] concentrated on controlling a TV for his project, but it’s easy to see how his method could interface with other IR remotes to achieve control over everything from alarm systems to windows and drapes. His open-source project uses a web cam to watch a user’s head gestures, and OpenCV running on a CHIP SBC looks for motion in the pitch, yaw, and roll axes to control volume, channel, and power. An Arduino takes care the IR commands to the TV. The prototype works well in the video below; with the power of OpenCV we can imagine mouth gestures and even eye blinks adding to the controller’s repertoire. The Assistive Tech phase wraps up tomorrow, so be sure to get your entries in. You’ll have some stiff competition, like this robotic exoskeleton. But don’t let that discourage you. [yoyotechKnows] built an Alexa-controlled garage door opener after his Liftmaster stopped working. Now all he has to do is holler at his mobile phone and he can raise and lower his garage doors at will. His project is based around a Photon WiFi kit, with a pair of LCC 120 digital relays triggering the two doors, reed switches, and a serial-equipped LCD to display door status, with Alexa, IFTTT, and OpenHab to process the commands. You can find his code in the project writeup. Currently he has a LCD display informing him of the status of each door, hot glued a reed switch to keep track of whether each one is closed. This might seem a little bit extraneous since he can also just look at the doors from within the garage. However, he’s thinking about putting the display inside his house. But couldn’t he just ask Alexa? We love us our home automation here at Hackaday, with everything from swimming pools to chicken coops rigged for app control and datalogging. Sometimes you see an excellent post somewhere else on the web, and then discover that it is one of a series of similarly good posts that you completely missed when they were published. If you are a Hackaday scribe you are left wondering how you managed to pass them by, and then why on earth you didn’t think of writing them yourself. Such is the case with [Sanket Gupta]’s excellent series for Octopart, of posts titled “How to select a…” and then a class of component. It was the latest, “How to select a voltage regulator” that caught our eye first, but then we found the previous installments dealing with capacitors, resistors, inductors, connectors, IC packages and MCUs. Each one provides a basic primer for the engineer, in terms of both parts selection based on capability and on suitability for manufacturing, and while you may think that only an inexperienced reader might find benefit in such pieces the reality is that everybody can learn something. So if you are involved in choosing electronic parts, no matter at what level, take a look at this series. If you know everything [Sanket] has to say then we congratulate you on your mastery of the field, however we think most readers will find them to be an interesting and useful resource. Header image: Kae [Public domain].